A closer analysis has been performed on the recent video of the UFO sighting in Seoul Korea from the window of an airplane. On April 7th, 2012, a passenger aboard a flight passing over Seoul, Korea captured some amazing footage of a UFO flying below the plane. The video clearly shows a white, round cylindrical object flying into frame in the lower right corner, then swirling off upwards and out of frame. The video is about 30 seconds in length and was taken by a passenger in an airplane while in flight. This is the biggest and most widely reported UFO sighting in 2012 and certainly the most profound sighting since the UFO sightings over Mexico last year. As we reported last year, the fact that most people are now carrying cameras and video recording devices in the form of their cell phones means more UFO sightings are bound to pop up. 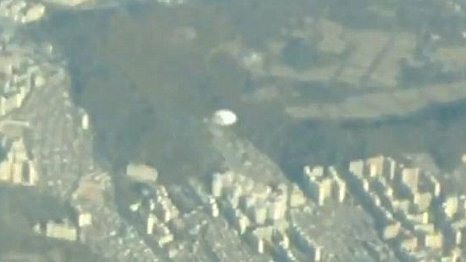 This new UFO sighting video footage slows down the video shot from the airplane over Seoul, Korea so that you get a better look at the craft and it's relation to the city scape below and the airplane. This footage has caused many to discredit the sighting stating that it doesn't make sense that the person would have just happened to turn on his video recording device (not sure if it was a video camera or a cell phone) just in time to capture the UFO crossing his path. This has many people claiming that the UFO sighting over Seoul, Korea was indeed a fake, and that the video was doctored and edited. Whether or not the video is real or fake, it is truly a great video, otherwise it could not have garnered such National attention. We, at Kansas City News, have analyzed the video several times and do not find anything conclusive as to it's authenticity, and therefore we have to commit that this UFO sighting is plausible. This also backs our previously stated theory that if UFO's do indeed exist, a lot more photos and video sightings will emerge due to the "pocket recorders" that most of the world's population now has on their person at all times. We have already seen a massive increase in new UFO sightings in Kansas City, Lee's Summit, Raytown, Independence, Overland Park, Shawnee and Prairie Village in 2012 alone. Just as the new video UFO sighting over Seoul, Korea, this either proves that UFOs do actually exist and that we are just better equipped to quickly snap photos and videos of them, or that along with the advancement of technology, so has the ability to create fake videos and doctor up photos using the latest editing software. Either way, it sure makes great news! It looks like this UFO sighting might be a parachute or skydiver. It looks like the parachute is moving faster than it is because both the parachute AND the airplane from which the video is being taken are both moving. It looks like the airplane may be going in for a landing, or making a turn, thus making the parachute look like it's moving faster / differently than it really is. I think that the video looks very good. One of the best ufo videos to come out in a long time. There is always the chance that they are just trying to get a viral video started. Hard to say but this one looks real. My wife had a ufo sighting 3 years ago and after she saw this video she thinks that it is the same ufo that she saw back then. Hard to tell these days what is real and what is not with all that modern technology! Yikes! I'm very afraid of flying as it is , I couldn't imagine having a ufo sighting and dealing with that plus my fear of flying at the same time, although it did look like the airplane was either getting ready to land or possibly had just taken off. It looks more like it was in the process of landing. That is some really great ufo footage, thanks for posting.